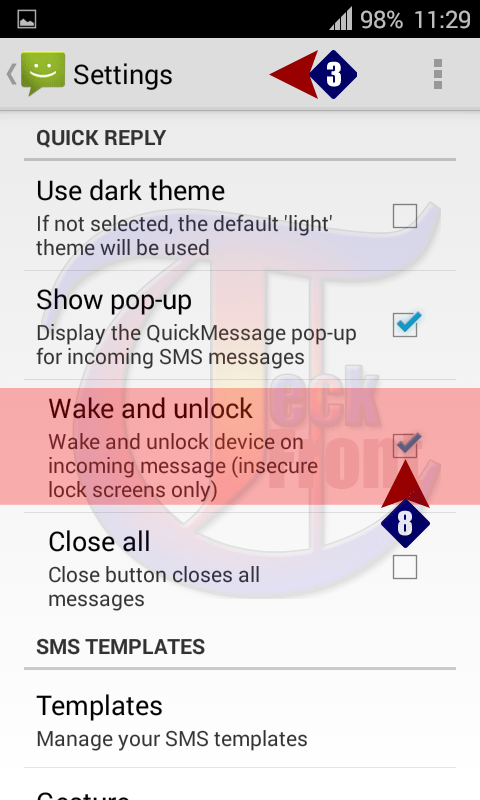 Android 4.4.4 KitKat: How to Set Wake and Unlock When Message is Received? 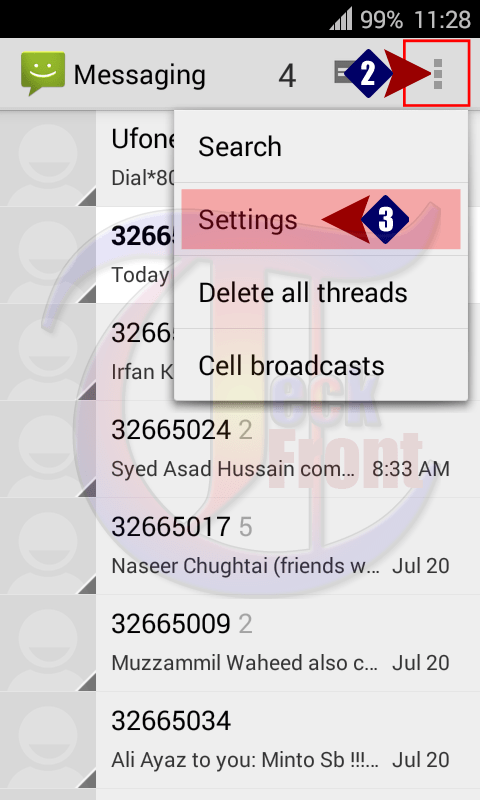 Android 4.4.4 KitKat can be set in such a way to wake and unlock whenever an incoming message is received in this phone. This feature is especially added for the people who receive frequent messages and for them attending each and every message, immediately, is rather vital. Time spent in waking and unlocking the phone may be troublesome and/or waste of time for some people. So, if this feature is activated in you Android 4.4.4 KitKat phone, it will, automatically, wake and will become unlocked as well for you to read the message, immediately and conveniently. Command Line: Messaging app > Settings > Message settings > QUICK REPLY – Show pop-up. 1: Tap the ‘Messaging’ app icon, available at the Home screen of your Android 4.4.4 KitKat phone. 2: At the ‘Messaging’ screen, tap the ‘Settings’ button, available at the top right corner of phone. It will open up a popup menu. 3: In the popup menu, tap the ‘Settings’. 4: At the message settings, see the ‘Show pop-up’ under the QUICK REPLY is unchecked and disabled. 5: In addition to it, see that the relevant option, ‘Wake and unlock’, given immediately under the ‘Show pop-up, is also disabled. 6: To display the Quick Message pop-up for incoming messages, tap the ‘Show pop-up’ under the QUICK REPLY to check and it will be enabled. 7: See the ‘Wake and unlock’ feature is also enabled but it may become enabled to be checked and enabled. Now, you can check it to enable it. 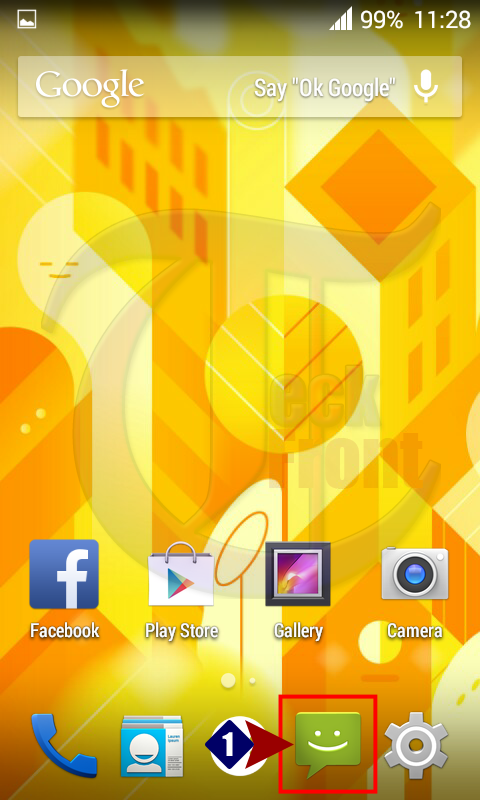 8: Check the ‘Wake and unlock’ to enable it. Now, your Android 4.4.4 KitKat phone will wake and unlock whenever new incoming message will be received in this phone and you may read the message at the convenience. Newer Android 4.4.4 KitKat: How to Delete Messages, Individually? Older Android 4.4.4 KitKat: How to Delete Messages, Automatically?